With Japan’s ageing population and cheap debt forcing its biggest corporates to look outside the country for growth, Debevoise & Plimpton has become the latest US law firm to launch in Tokyo. Boosted by the availability of cheap debt, Japanese corporates have become more acquisitive over recent years as they hunt growth, often looking to Europe for mergers and acquisitions. Debevoise & Plimpton’s new office will be centred on corporate work, with partner Christopher Smeall and counsel Naomi Aoyama relocating from New York to lead the office. The Tokyo launch is Debevoise’s first international expansion in over a decade, with the last office opened in Shanghai in 2002. Tokyo will be its ninth global office. The opening better positions Debevoise to take advantage of rising M&A volume from Japan into Europe. Japanese corporates spent a whopping $90.49bn on overseas acquisitions last year, up nearly 70% on 2014, according to data from Dealogic. Among those deals were Mitsui Sumitomo Insurance Company’s £3.5bn deal for UK insurer Amlin and media company Nikkei’s £844m purchase of the Financial Times. Debevoise presiding partner Michael Blair said the launch will ‘allow us to provide even better support and service to our clients located in Japan or engaged in matters relating to Japan’. The move follows a growing wave of law firm investment in Tokyo, with US rivals Greenberg Traurig and King & Spalding launching in Japan last year. Squire Patton Boggs has bolstered its presence in Tokyo by tying up with Japanese corporate boutique Mamiya Law Offices (MLO) around 18 months ago. Debevoise & Plimpton ended a period of slow growth by posting a 6% rise in revenue to $756.9m as profits surged by 10%. The New York-headquartered firm added $41.6m to its top line in 2015, matching the 6% growth rate achieved between 2010 and 2014 after an improved performance. Profits per equity partner (PEP) at the firm rose 10% to $2.62m, handing the firm’s 134 equity partners over $300,000 more than they received in 2014. 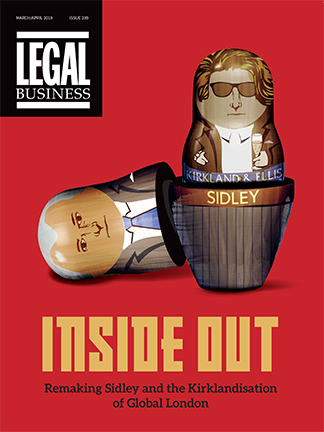 The firm’s London office, headed by high profile disputes partner Lord Peter Goldsmith QC and tax lawyer Richard Ward, is understood to have registered a 20% rise in revenue to $110.5m. With the London arm having recorded revenue of around $92m in 2014, the firm added nearly $20m to break the $100m barrier. Growth of the office, home to 110 lawyers, was driven by strong performances in the funds and disputes space. Its City lawyers acted for private equity funds Ares on the creation of a $1.3bn real estate fund, Exponent on a £1bn PE fund and Park Square Capital on a $2.4bn fund for distressed assets. Last year the firm posted a 3% revenue rise to $710m, up nearly $22m on 2013, while partner profits also increased by 3%. With a small increase in the size of its partnership, from 138 in 2013 to 134 in 2014, the growth was largely organic. Debevoise & Plimpton, Allen & Overy (A&O) and Fenwick & West have scored roles advising video game maker Activision Blizzard on the acquisition of Candy Crush creator King Digital Entertainment for $5.9bn – one of the largest deals in the fast-growing interactive entertainment industry. The acquisition will create one of the world’s largest entertainment networks with over a half a billion monthly active users in 196 countries. Under the agreement, ABS Partners – a wholly owned subsidiary of Activision Blizzard – will acquire all of the outstanding shares of King Digital at $18 per share, for a total equity value of $5.9bn. The acquisition is expected to generate over $36bn of revenue by the end of 2015 and grow by over 50% in the next four years. Debevoise was lead M&A counsel for the deal with a team led out of New York by its corporate chair Jeffrey Rosen and co-head of M&A William Regner. Finance partner David Brittenham, benefits chair Lawrence Cagney, tax partner Gary Friedman and corporate partners Paul Rodel and Jeffrey Ross also worked on the transaction. Activision Blizzard turned to A&O for advice on competition aspects in the EU, led by antitrust partner Dirk Arts, alongside Irish firm Mason Hayes & Curran. Dublin-based King instructed Irish firm William Fry with US advice from tech firm Fenwick & West. A&O has been active in the financial technology arena, working on a raft of IPOs including Worldpay, Equiniti, Funding Circle and Softcat. Litigators at the London arms of Debevoise & Plimpton and Reed Smith have been drafted in on a €578m (£418m) professional negligence claim brought by British American Tobacco (BAT) against Big Four accountancy firm PwC. BAT has instructed Kevin Lloyd, a partner at Debevoise & Plimpton, to bring the claim against PwC in the Chancery Division of the English High Court. The legal action stems from PwC’s audit of paper maker Windward Prospects, a company with which BAT has a long-running dispute over the cost of cleaning up a polluted river in Wisconsin. BAT alleges PwC failed to fully account for clean-up costs of the polluted river in its audit of Windward. The dispute led the world’s second-biggest cigarette maker to jettison PwC as its own auditor in early 2015, a position it had held since BAT listed on the London Stock Exchange in 1998. BAT, which is also involved in a high-profile judicial review against the UK Government’s plain packaging rules for tobacco products, has since overhauled its global legal function to incorporate corporate and regulatory affairs. Lloyd, who joined Debevoise from Herbert Smith Freehills in 2013, has instructed Andrew Thompson QC of Erskine Chambers to bring the case before the courts. PwC, which wants to strike out the case on the basis there is no cause of action, argues the dividends were based on interim accounts and not audited accounts. The firm has instructed Reed Smith’s co-chair of global regulatory enforcement Charles Hewetson to defend the claim. Hewetson has brought in well-known professional negligence barrister, Simon Salzedo QC of Brick Court Chambers, as counsel. Herbert Smith Freehills (HSF) has picked up a new client as a number of firms took advisory roles in Sacturino’s bid to buy the remaining part of Polyus Gold it does not own. Russian billionaire Said Kerimov’s company Sacturino, together with its parent company Wandle Holdings, already owns a 40.2% stake in Russia’s largest gold producer Polyus Gold. Jersey-based Polyus, which had instructed Debevoise & Plimpton in 2012 for its stock exchange listing, turned to HSF, which advised with a team led by London corporate partners Mike Flockhart, Greg Mulley and global M&A head Steven Wilkinson. Sacturino was advised by Norton Rose Fulbright with a London team led by partners Chris Pearson and Paul Whitelock supported by corporate partner Simon FT Cox and banking partner Rich Hughes. A Norton Rose team from Moscow is being led by partners Julian Traill and Alexander Tsakeov. This time around Debevoise is on the other side of the deal table, acting for Sacturino alongside Jersey firm Bedell Cristin on the financing aspects of the deal, which values Polyus Gold at $9bn. The financier for Sacturino’s bid VTB Capital was advised by Allen & Overy (A&O) with a team led by banking partner Sanjeev Dhuna and supported by corporate partner Richard Hough and tax partner Chris Harrison. Ogier Jersey also acted alongside A&O with a team led by partner Chris Byrne. On Wednesday Polyus said the offer was disappointing and had ‘materially undervalued’ the company. HSF has recently advised opposite EY for British American Tobacco as its long standing client signed a conditional agreement to acquire 100% of Europe’s largest eCigarette retailing network, CHIC. Allen & Overy’s (A&O) New York office and Debevoise & Plimpton have won roles advising IT company CSC on its combination with US public sector tech outfit SRA to create a company with $5.5bn in revenues and billed as the ‘largest pure-play IT services provider serving the US government sector’. The soon-to-be split CSC will combine its government services unit, Computer Sciences Government Services (CSGov), with SRA, creating a company with combined annual sales of $5.5bn and a workforce of nearly 19,000 employees. A&O advised CSC on the deal which sees CSGov’s shareholders own 84.7% of the new company. Its New York-based team was led by M&A partner Peter Harwich, alongside the firm’s head of tax Jack Heinberg and co-head of antitrust Elaine Johnston. In May, A&O advised CSC when it first announced its was to separate its government services unit into two independent publicly traded companies, for which Harwich also led. Debevoise is acting for both SRA and its owner Providence Equity Partners, with a team led by partners Margaret Davenport and Michael Diz, along with partners Gary Friedman, Jonathan Lewis, Pierre Maugüé and Steven Slutzky. Under the deal, SRA’s shareholders will own 15.3% and will receive $390m in cash. The deal aims to close before the end of November 2015, when CSC’s is set to separate its government services unit. Having endured a spate of high profile departures from its corporate offering in recent years, Clifford Chance (CC) has made a notable recruit with disputes lawyer Jessica Gladstone joining as a partner from the City office of US firm Debevoise & Plimpton. Before joining Debevoise as international counsel and solictor-advocate in 2010, Gladstone previously served as legal adviser at the UK’s Foreign and Commonwealth Office, where she managed international and domestic litigation, and represented the UK at the UN General Assembly, in the Council of Europe and in cases before the European Court of Human Rights. Specialising in international public law, high profile mandates on which Gladstone has advised include a $1.2bn arbitration between Malaysia and Singapore and a dispute between the British Caribbean Bank and the Attorney General of Belize over a decision to nationalise the telecomms industry in Belize. In May, Legal Business revealed CC voted through proposed changes to its remuneration system which will see the firm deploy a more flexible lockstep by stretching the top of the ladder in a bid to retain star partners. The firm has lost multiple corporate partners, particularly in the private equity space, in recent years with the latest departure being German banking chief Alexandra Hagelüken becoming the latest to move to US firm Latham & Watkins.